Kriste has been working in the veterinary field in and around Sacramento, California, since 1997. After receiving her RVT in 1999, she began working in emergency and holistic medicine, which sparked her interest in the human–animal bond and quality-of-life focus in veterinary medicine. In 2008 she received her veterinary technician specialist certification in oncology, and since then has lectured around the United States on various topics related to cancer and compassionate care. She has been working as the Medical Oncology Supervisor at the University of California, Davis, since 2010. Lymphoma (more properly termed lymphosarcoma) is a cancer of lymphocytes that affects approximately 13 to 24 dogs per 100,000 annually and accounts for up to 24% of all canine neoplasias in the United States.1 It is characterized by an abnormal population of lymphocytes, which are an important part of the immune system. B lymphocytes (or B cells) produce antibodies in response to specific antigens. These antibodies “lock on” to the antigen, thus marking it for destruction by the T lymphocytes (or T cells). The determination of cell origin as B cell or T cell gives important predictive information on response and survival times in lymphoma patients. Lymphoma usually arises in lymphoid tissues, such as the lymph nodes, spleen, and bone marrow, but can be found anywhere in the body. Multicentric lymphoma, which involves multiple lymph nodes and may also affect the spleen, liver, and/or bone marrow, accounts for approximately 80% of canine lymphoma cases. Lymph node biopsy is the gold standard for diagnosing lymphoma. High-grade lymphoma, which is characterized by the proliferation of large, immature lymphoblasts, can often be diagnosed with simple fine-needle aspiration (FNA) of the affected nodes. FNA should be performed on a lymph node that is unlikely to be associated with reactivity; therefore, it is best to avoid aspiration of the submandibular lymph nodes if another affected lymph node is available. Reactive lymph nodes have a more mixed population of lymphocytes, with lymphoblasts making up only approximately 50% of the population; plasma cells are common. Grade and stage are often important in classifying cancers and determining prognosis. Grade is determined by histopathology and refers to how aggressively a tumor is expected to behave. Factors considered in grading include invasiveness, degree of necrosis, cellular atypia, and mitotic index.1 Stage refers to how far the tumor has spread in the body (BOX 1). Grade is a very important prognostic factor for lymphoma. Low-grade lymphoma, also known as small-cell lymphoma, is characterized on cytology by a relatively homogeneous population of small, mature lymphocytes that may not look different from a normal lymph node population. Biopsy is necessary to further evaluate whether a cancerous process is present. Small-cell lymphoma progresses more slowly than large-cell, or high-grade, lymphoma. On cytology, high-grade lymphoma is characterized by a monomorphic population of large, immature lymphoblasts, which are approximately the size of a neutrophil or larger. Left untreated, it is a fast-moving, aggressive process that generally proves fatal in 6 to 8 weeks. Fortunately, its rapid progression makes it very responsive to chemotherapy, and because it is a systemic cancer, chemotherapy is the cornerstone of treatment. Staging tests should consist of a serum biochemical profile, a complete blood count with differential, thoracic radiography, abdominal ultrasonography, and potentially a bone marrow evaluation. A baseline measurement of all affected lymph nodes should be obtained, as should a thorough cardiac evaluation. If a murmur or arrhythmia is appreciated on auscultation, echocardiography should be considered because cardiac disease may warrant a change to the chemotherapy plan. The most important and effective way to lower calcium levels in lymphoma patients is to treat the underlying cause (ie, the lymphoma). Initiation of L-asparaginase and steroid therapy to reduce the population of cancer cells leads to the reduction of calcium levels. Often, however, lymphoma patients present with dehydration and require aggressive fluid therapy. After adequate hydration is achieved, a diuretic, such as furosemide, may be considered. Corticosteroids should not be administered before confirmation of the lymphoma diagnosis because rapid reduction of the tumor burden can make definitive diagnosis difficult or impossible. A bisphosphonate (pamidronate, zoledronate) may be administered to lower the calcium levels; however, treating the lymphoma is still the goal, and care must be taken to protect the kidneys during administration. Leukopenia may be present if the bone marrow is involved because of crowding of the normal marrow tissue by cancerous cells. This is called myelophthisis and can present a treatment challenge—administration of chemotherapy may cause the white cell count to drop further, leaving the patient susceptible to infection. Conversely, the patient may have leukocytosis secondary to circulating cancer cells (leukemia) or a stress leukogram. Thrombocytopenia may be secondary to bone marrow involvement or immune mediated. Hypercalcemia of malignancy is a paraneoplastic syndrome that is commonly associated with T-cell lymphoma. It is due to the tumor producing parathyroid hormone–related protein, which mimics parathyroid hormone in the body, although the reason for the protein production is unknown. Hypercalcemia is a medical emergency because, if persistent, it can lead to renal failure (BOX 2). Confirmation of hypercalcemia of malignancy requires a specific panel of tests. Azotemia may be present because of many factors, including dehydration, persistent hypercalcemia leading to calcification of the renal cortex, or renal involvement of the lymphoma. Elevated liver enzymes may be present if the liver is involved. Depending on severity, liver involvement may warrant alteration of the chemotherapy protocol because many of the drugs used are metabolized by the liver. Impaired clearance of chemotherapeutics can lead to increased side effects or a relative overdose. Treating the lymphoma with drugs that do not require hepatic clearance may allow the enzyme levels to normalize, and then the protocol may be adjusted. Lymphoma is further classified by substage, either a or b, which simply refers to how the patient is doing clinically. A patient that presents with a normal appetite and energy level would be classified as substage a, whereas a patient that is feeling poorly on presentation would be substage b. Patients that do not feel well on presentation have an overall poorer response rate and prognosis. It is better to initiate therapy while the patient is feeling well than to wait until the patient is compromised. FIGURE 1. A patient receiving rabacfosadine for lymphoma. She is allowed to position herself comfortably with minimal restraint for the infusion. The goal of lymphoma treatment is to induce clinical remission, indicated by lack of measurable disease, while retaining a high quality of life. Because lymphoma is a systemic disease, chemotherapy is the foundation of treatment. Using calculated lower doses that are used by human oncologists usually keeps side effects minimal and short term; however, some patients may require hospitalization, and death from tumor lysis syndrome can occur. A common client misconception is that administering chemotherapy to animals is in some way inhumane. This stems from assumptions about the goals of cancer therapy in companion animals and the incidence of side effects from therapy. It can be helpful to the client to present cancer therapy as treatment of a chronic condition, similar to treatment of renal or heart disease. Many clients are willing and able to administer daily medication or SC fluids, and a weekly chemotherapy visit is much less daunting when framed in those terms. Most chemotherapy protocols have 2 phases: induction and consolidation. 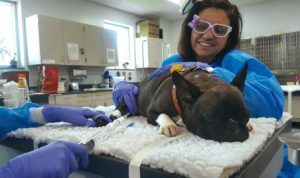 The induction phase consists of weekly treatments designed to place the pet into remission rapidly. It is more dose intensive than the consolidation phase, which is designed to kill any remaining tumor cells and requires less frequent treatment. Lymphoma is ideally managed with a combination of drugs. Several different protocols are used, but most are based on a combination of drugs commonly abbreviated as CHOP, or L-CHOP. L (L-asparaginase): This enzyme degrades the amino acid asparagine. Asparagine, which is synthesized by normal cells, is necessary for protein synthesis; however, lymphoma cells are unable to synthesize asparagine. Rapidly dividing cells need to produce large amounts of protein to progress through the cell cycle. If deprived of asparagine, they cannot progress and thus undergo apoptosis. The most significant adverse reaction seen with L-asparaginase is hypersensitivity. Patients with prior exposure to the drug are predisposed to hypersensitivity reactions. Premedication with diphenhydramine and dexamethasone sodium phosphate, as well as SC administration of the drug, minimizes these reactions. Pancreatitis and coagulopathies (secondary to decreased protein synthesis) are also seen with L-asparaginase to a lesser extent. Doxorubicin should be administered only by a trained individual because it is a severe vesicant, and administration outside of the vein results in severe, progressive tissue necrosis. (Vincristine): This vinca alkaloid antitubulin agent is derived from the periwinkle plant. It is specific for cell cycle phase, inhibiting cell division during metaphase by binding to microtubular proteins in the mitotic spindle. It is generally not significantly myelosuppressive at the doses used in veterinary patients.2 Vincristine is the vinca alkaloid of choice for lymphosarcoma. Side effects of this drug include paralytic ileus, peripheral neuropathy, and syndrome of inappropriate antidiuretic hormone secretion. Vincristine is a vesicant and must be administered with care by a trained technician through a perfectly placed butterfly or over-the-needle catheter. P (Prednisone): A corticosteroid, prednisone directly kills cancer cells but can lead to drug resistance if used long term. It is often incorporated into multiagent protocols over the short term. Myelosuppression occurs secondary to damage caused by the chemotherapeutic agent to precursor cells in the bone marrow. The circulating neutrophil life span is 5.5 to 7.6 hours; thrombocytes, approximately 10 days; and erythrocytes, approximately 73 days.5 The blood cells with the shortest life span are the first to show damage; therefore, decreased neutrophil and platelet counts are most commonly seen clinically. Presenting signs can include pyrexia, petechiae, pallor, and weakness, although many patients with low white blood cell counts and platelet counts are clinically normal. It is important to check the neutrophil counts at the nadir to ensure the pet does not require prophylactic antibiotics. Patients receiving chemotherapy are not generally immunosuppressed. Rather, it is more accurate to state that they are myelosuppressed (ie, their bone marrow function is altered). These patients do not lose their acquired immunity, but they are susceptible to bacterial infections if their neutrophil counts drop too low. The difference between immunosuppression and myelosuppression is important because clients often ask whether they should curtail their dog’s activities during chemotherapy. As long as the pet is feeling well, it should be able to get groomed, go swimming, and generally enjoy its life. FIGURE 2. A patient waiting for treatment. Chemotherapy can cause gastrointestinal (GI) toxicosis through 2 mechanisms of action. The first is through direct stimulation of the chemoreceptor trigger zone. This is most common with the drugs cisplatin and dacarbazine, and it causes acute vomiting on the day of treatment. The second is through direct damage to the epithelium of the small intestine. The absorptive surface of the small intestine consists of numerous villi that are lined by a single layer of nonproliferating epithelial cells. These cells are replaced by cells that migrate upward from the crypts, which lie between and at the base of the villi. The high rate of cell proliferation in the crypts of the intestine makes these cells more vulnerable to the cytotoxic effects of chemotherapy.6 Direct damage to the intestinal epithelium results in vomiting, diarrhea, or inappetence, usually beginning 3 to 5 days after treatment. Translocation of normal gut flora resulting from intestinal damage can be a key source of bacterial infection. The consequences of significant GI toxicosis (dehydration, weight loss, financial burden of hospitalization, and treatment delay) can diminish client enthusiasm for continuation of treatment. Use of antiemetics and antidiarrheals is key. In patients with a history of GI complications from a particular agent, prophylactic therapy is often initiated 3 to 5 days before subsequent treatment. Quality of life is the number 1 priority in these patients. It is generally understood that the goal of therapy is not to achieve a cure, but to extend the patient’s life at as high a quality of life as possible. Luckily, pain is not often an important factor for lymphoma patients, but nausea and diarrhea can significantly affect quality of life if not recognized and addressed. FIGURE 3. 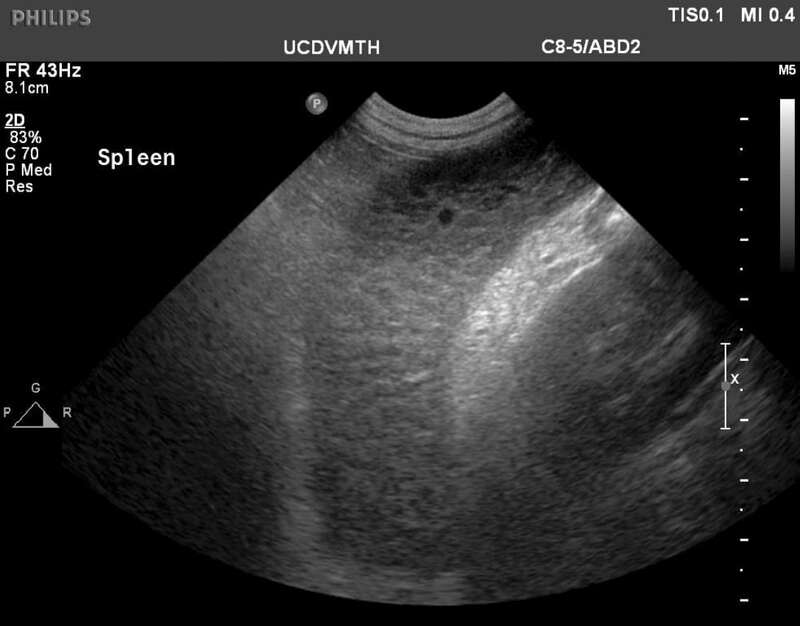 Ultrasound image of a spleen showing the characteristic “chicken wire” appearance of lymphoma. Dogs can be subtle in their signs of nausea. Instruct clients to watch for such signs as salivation or lip-licking, or simply encourage them to treat for presumed nausea in the case of food avoidance. Especially in the short term, it is less important what the pet eats; clients should favor feeding highly desirable foods, such as baby food or plain rotisserie chicken. Warming canned food (to make it more fragrant) can coax a pet to eat. Hydration is another important factor to consider. In human patients, dehydration can contribute to headaches and increased sensitivity to other painful stimuli. This cannot be adequately assessed in veterinary patients, but it is reasonable to assume they experience similar discomfort. Teach clients to assess skin turgor and oral “tackiness” as tools to help manage their pets’ hydration status and how to administer SC fluids as indicated. If a pet becomes anorectic or dehydrated, many supportive care options exist, but the main objective should remain the same: quality of life. A feeding tube may not be a viable long-term option; the same holds true (perhaps even more so) with syringe feeding. Instead, focusing on the underlying causes of inappetence or medically managing the clinical signs may yield better results. Antiemetics, such as ondansetron, maropitant, or metoclopramide, or appetite stimulants, such as mirtazapine, can sometime induce a pet to eat willingly. Obesity is common in these patients. Between prednisone administration and caregivers’ desire to “spoil” the pet for its remaining time, significant weight gain can occur. To avoid overdoses, attention should be paid to chemotherapy doses if the pet is continuously gaining weight. Having a little extra weight in case of illness is not a bad idea in these patients, but too much can lead to orthopedic and other issues. A word on diet: Many pet owners are very dedicated and wish to do everything possible to support their pets through this process. Commonly, the first step for them is to radically overhaul the pet’s diet regimen, switching to “natural” or “cancer” diets, or potentially feeding raw or home-formulated diets. This is to be discouraged, especially in the beginning stages of treatment. It can be difficult to assess whether a pet is experiencing GI toxicosis from chemotherapy or simply GI upset from a sudden change in its food or an adverse reaction to supplements. If clients wish to change their pet’s diet, instruct them on how to make a gradual change, ideally after the induction phase of chemotherapy is over. Encourage them to find a commercially available dog food, rather than home cooking, because many home-cooked diets are not nutritionally complete. If the client insists on home cooking, referral to a veterinary nutritionist is appropriate. Under no circumstances do I advise feeding raw diets to cancer patients because of the risk for systemic infection from unprocessed meat. Alkylating agent Drugs that prevent a cell from reproducing by damaging its DNA. Complete remission Complete resolution of measurable tumor burden. Median survival The point at which half of the patients have died and half of the patients are still alive. Differs from mean survival in that patients at either extreme (early deaths or long-term survivors) do not affect the median. Mitotic index In a population of cells, the ratio of the number of cells undergoing mitosis (cell division) to the number of cells not undergoing mitosis. Nadir The point after chemotherapy when the lowest white blood cell count occurs. The nadir differs for various chemotherapy agents, but is 7 to 10 days after administration for most drugs. Reactivity Inflammation and swelling of local lymph nodes resulting from inflammation of tissue and subsequent increase in white blood cells. Tumor lysis syndrome Electrolyte and metabolic disturbances (eg, hyperkalemia, hyperphosphatemia, hypocalcemia) resulting from release of tumor cell contents into the blood stream, either spontaneously or in response to therapy. aDorland’s Illustrated Medical Dictionary. 30th ed. Philadelphia, PA: Saunders; 2003. Many commercial supplements advertise immune support or other benefits for cancer patients. Most have not been evaluated by a regulatory body to determine their safety or efficacy, and drug interactions can occur.7 “Natural” does not mean something is safe or without side effects; vincristine is derived from the periwinkle plant, after all. Additionally, some of the intended benefits of the supplement may run counter to the goals of cancer treatment. An example is antioxidant supplementation. Both chemotherapy and radiation therapy promote oxidative damage to kill cancer cells. The protective effects of antioxidants may extend to the cancerous cells as well as the normal tissue.2 Consultation with a veterinarian who is well versed in supplement therapy and its application during chemotherapy should be considered. If the patient is inappetent, it may be wise to stop supplement therapy and gradually reintroduce it if appetite returns. From a quality-of-life standpoint, simply reducing the number of medications a patient is taking daily to the minimum necessary may be a relief to both patient and caregiver. There are many more approaches to managing canine lymphoma patients—the L-CHOP chemotherapy protocol is only the most commonly used. These drugs were adapted for use from human oncology. 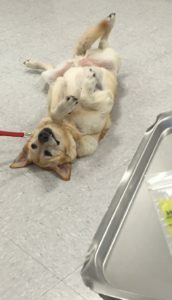 Research is being done to implement new therapies that are tailored to canine patients. Monoclonal antibody therapy and rabacfosadine (Tanovea CA-1; vet-dc.com) are two new therapies available to the veterinary oncology team, but more research is needed to evaluate their merits compared with current standards of care. In all cases, preserving quality of life and the human–animal bond remains the goal of all veterinary cancer therapy going forward. Hemapoietic tumors. In: Withrow S, Vail D. Small Animal Clinical Oncology. 4th ed. Philadelphia: Saunders Elsevier; 2013: 608-631. Diagnosis of cancer. In: Moore AS, Frimberger AE. Oncology for Veterinary Technicians and Nurses. Ames, IA: Wiley-Blackwell; 2010: 24. Lurie DM, Gordon IK, Théon AP, et al. Sequential low-dose rate half-body irradiation and chemotherapy for the treatment of canine multicentric lymphoma. J Vet Intern Med 2009;23(5):1064-1070. Plumb D. Veterinary Drug Handbook. 8th ed. Ames, IA: Wiley-Blackwell; 2015: 81-82, 362, 1087. Feldman B, Zinkl J, Jain N. Schalm’s Veterinary Hematology. 5th ed. Baltimore: Lippincott Williams & Wilkins; 2000. Tannock I, Hill R. The Basic Science of Oncology. 4th ed. New York: McGraw-Hill; 2005. Complementary and alternative medical therapies. In: Moore AS, Frimberger AE. Oncology for Veterinary Technicians and Nurses. Ames, IA: Wiley-Blackwell; 2010: 90-93. The article you have read has been submitted for RACE approval for 1 hour of continuing education credit and will be opened for enrollment when approval has been received. To receive credit, take the approved test online for free at vetfolio.com/journal-ce. Free registration on VetFolio.com is required. Questions and answers online may differ from those below. Tests are valid for 2 years from the date of approval. a blood test for high calcium. a blood test for high lymphocytes. Why is the submandibular lymph node a site to avoid when performing aspiration in a suspected lymphoma patient? dogs metabolize chemotherapy differently than humans. their side effects are not as obvious. Which of the following statements is true of vomiting and diarrhea in canine cancer patients? They are not clinically significant. They usually happen the day of chemotherapy. They usually happen 3 to 5 days after treatment. They are usually severe and untreatable. True or false: Changing a pet’s diet in the first stages of cancer therapy should be avoided because GI upset could be mistaken for side effects of chemotherapy. unvaccinated puppies at the dog park. the dog’s own gut flora. A boxer presents to the clinic for inappetance. On physical examination, she has enlarged submandibular, superficial cervical, and popliteal lymph nodes. FNA reveals lymphoma. Blood work is normal except for a high calcium level. Thoracic radiographs are unremarkable, and abdominal ultrasound shows involvement of the liver and spleen. What stage is this dog’s cancer? What determines whether the patient in question 7 is substage a or b? What other test(s) might be valuable to better categorize the disease process in question? True or false: Grade and stage are best described by this statement: Grading consists of determining where the cancer has spread in the body, whereas stage is determined by looking at the tumor under a microscope.